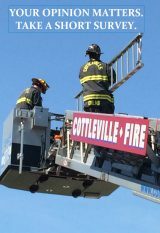 The Cottleville Fire District would like to congratulate Fire Marshal Mark Boehle on his recent retirement of 36 years. Mark had the honor of being the first full-time firefighter of the Fire District back in July of 1982. Mark quickly advanced to the rank of Fire Marshal/Assistant Chief where he continued his career until his retirement in December 2018. We would like to thank him for his dedication and his commitment to the fire service, and to our community that he served for all of these years.